Make urgent and important calls quickly and easily, even when under pressure or in stressful situations. Have a set of selected personal contacts and emergency numbers ready to dial. Give Red Contact to your elder family members and be sure that they will be able to contact you in case of need. Red Contact is optimised for the iPhone 6 and the Apple Watch, but also run on earlier iPhones, including the iPhone 4. “One tap away” from starting any urgent call (well…, two taps if you include launching the App). Large “call buttons” ensure that you do not get confused, especially if you are under pressure. Suited for everyone, ideal for elder people and impaired users. People to relay on in case of need. You can freely select them from Contacts on your iPhone (please note that they are not necessarily your friends or “favorites”). There are no limits to the number of contacts you can pick (although this is typically a small group of people). Up to four Emergency Services ready to dial. You can set and customise the related buttons depending on your needs. You can also select the phone numbers from a worldwide list of default emergency numbers by Country. Designed with the Apple Watch already in mind. Your Phone data are immediately and seamlessly synchronised on your Watch App. Calling directly from your Watch is as fast and easy as on your iPhone. A SMS is automatically set for you to send to your personal contact just after you hang up (it may include your location, if you allow for it). At this point, you can confirm or just cancel the SMS (you can disable this feature in the App’s Settings). You can select your Contacts and Emergency Services and change them when you want. You can also customise the App look and feel and disable the automatic SMS feature. Emergency Numbers and Personal Contacts are all on one main window. Emergency Services are set by default and can be easily customised (and selected from a worldwide list of numbers by Country). Personal Contacts can be selected from your Contacts App. Large, visible buttons allow for easy and quick calls. A preset SMS is ready to be sent right after a call, even when the call did not go through. 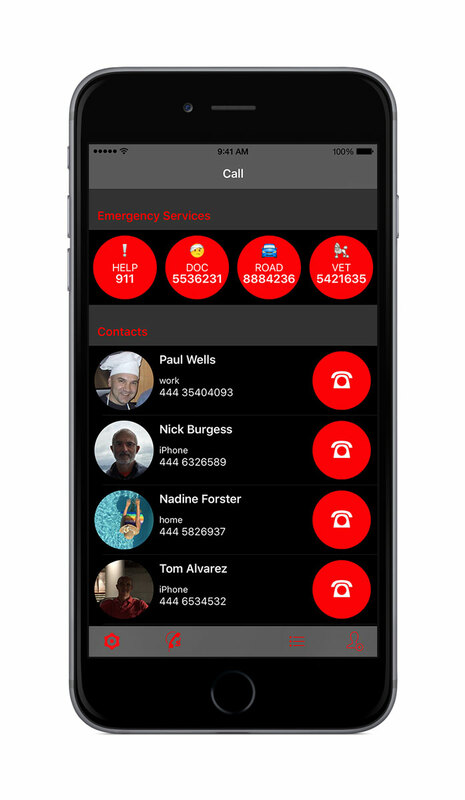 The utility bar buttons allow for adding Contacts, rearranging the Contact's list, customising Emergency Numbers and setting additional Preferences. Personal Contacts can be selected any time from your Contacts App. They can be ordered and removed as necessary, all in one window. Any number of contacts can be selected, although this is typically a small group of people. 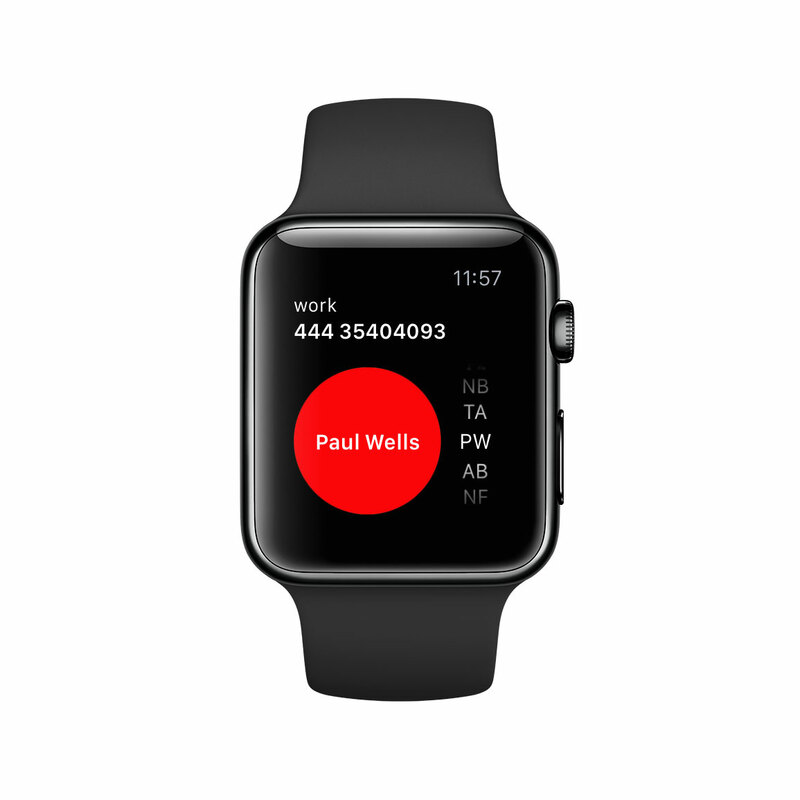 All the Emergency Numbers and the first twelve Personal Contacts in your list are automatically copied on the companion Watch App when installed, and can be accessed from there. Setting preferences and adding new Contacts is also accessible from the utility bar on the bottom of this window. 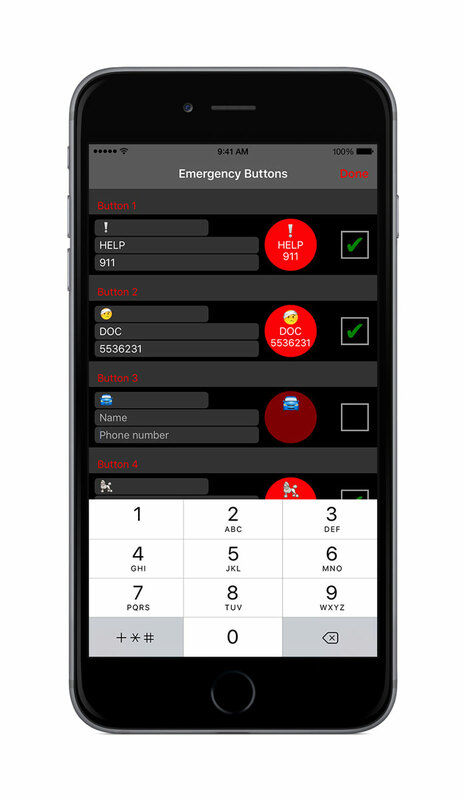 Up to four buttons can be set on the top of the main screen for calling Emergency Services. They are initially set by default, based on the Language & Region Settings on your iPhone. They can be customised depending on needs, location, etc. It is also possible to select emergency numbers at any time (e.g. if you are travelling) from a worldwide list of emergency numbers by Country. Your App data on the iPhone (all your Emergency Numbers and up to 12 Contacts) are immediately and seamlessly synchronised with your App on the Apple Watch. Calling from your Watch is as fast and easy as on your iPhone. One large button on the main page allows for a prompt call to the first Personal Contact in your list. The other numbers can be picked with the Digital Crown by scrolling down for additional Contacts and scrolling up for Emergency Services.